Decorative, etched designed automatic air freshener that complements the décor of many rooms. Portable, battery-operated air freshener unit adds fragrance anywhere. Easy-open latch design makes changing refills easy. Choose one of three time settings or press the button for an extra burst of fragrance anytime. Up to 60 days of freshness. Feel welcome every time you walk into the room! 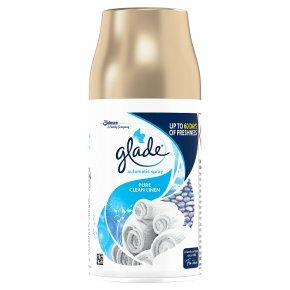 The unique formula in Glade Automatic Spray Air Freshener quickly fills the room with freshness and a wide range of incredible fragrances. The attractively designed holder of Glade Automatic Spray complements your décor from anywhere within the room, creating an always -welcoming atmosphere. The beloved scent of fresh line-dried laundry gets a modern twist with notes of watery melon, crisp air and a sparkling citrus blend. Extremely flammable aerosol. Pressurised container: May burst if heated. Causes serious eye irritation. If medical advice is needed, have product container or label at hand. Keep out of reach of children. IF IN EYES: Rinse cautiously with water for several minutes. Remove contact lenses, if present and easy to do. Continue rinsing. If eye irritation persists: Get medical advice/ attention. Protect from sunlight. Do not expose to temperatures exceeding 50 °C. Keep away from heat, hot surfaces, sparks, open flames and other ignition sources. No smoking. Do not spray on an open flame or other ignition source. Do not pierce or burn, even after use. Contains: Geraniol; 4-tert-butylcyclohexyl acetate; Citral; Linalool. May produce an allergic reaction. Repeated exposure may cause skin dryness or cracking. Use only in well-ventilated areas. Store in a cool, dry place. People suffering from perfume sensitivity should be cautious when using this product. Air fresheners do not replace good hygiene practices. Solvent abuse can kill instantly.